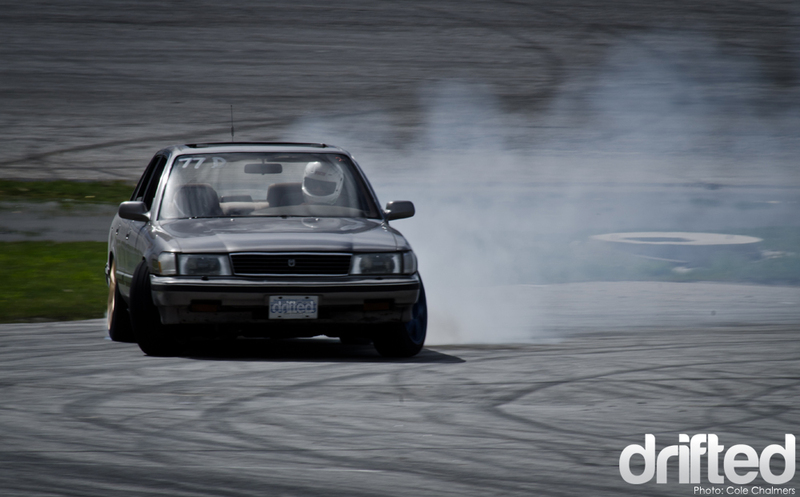 This past weekend, after a long winter, the Kelowna drift scene finally popped out of hibernation when Drift Union and Penticton Speedway hosted D-Day 13. Some changes were tested out to make things more entertaining for the crowd, including having an announcer and having some light-hearted competitions. Unfortunately, the weather had other plans and the weak left for home early, but the die hard’s who persevered got to take part in a pretty good show! The day started off dry and, for a little bit, it almost looked like it was going to clear up. 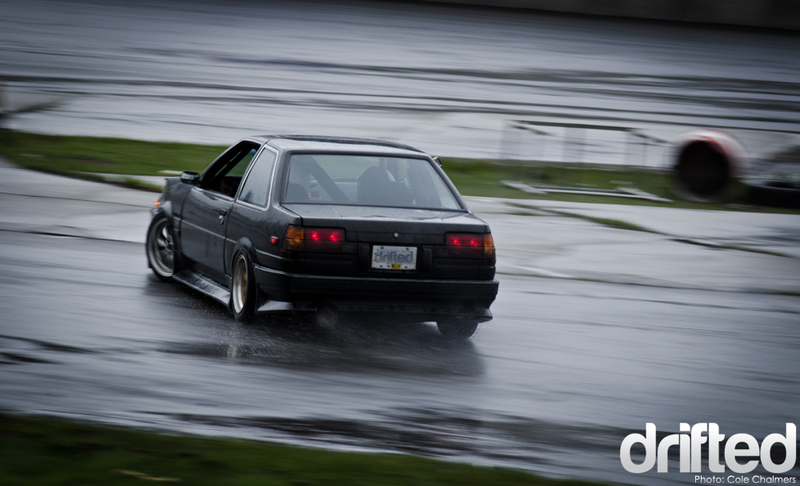 But after an hour and a bit of tire smoke, the heavens opened up and turned the track into a slip-n-slide. The big power boys were a little disappointed, having their smoke trails stolen, but the lower powered cars took advantage of the situation. Even I got out on track for a few laps in my automatic, open diff, Toyota Cressida wagon. Trevor Pudar made the trip out from Vancouver in his supercharged Corolla. Rain or shine, Trevor still slays. I guess when you live on the coast though, you get a fair share of rainy days. Another crew who made an even longer trip was Drift Squad and their posse from Alberta. 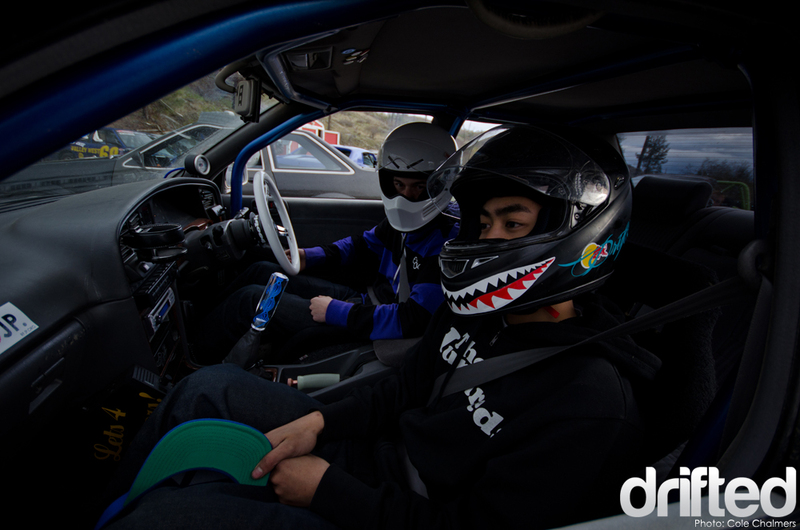 Jack Connelly (Toyota Cresta) and Eric Zapata (1JZ S13) are always down to party, on and off the track. Jack was throwing down some solid tandem runs with Steve Thompson in his 2JZ powered Soarer and Eric had just finished his 1JZ swap before tossing it on the trailer and leaving for BC, breaking it in proper by going straight to shredding. 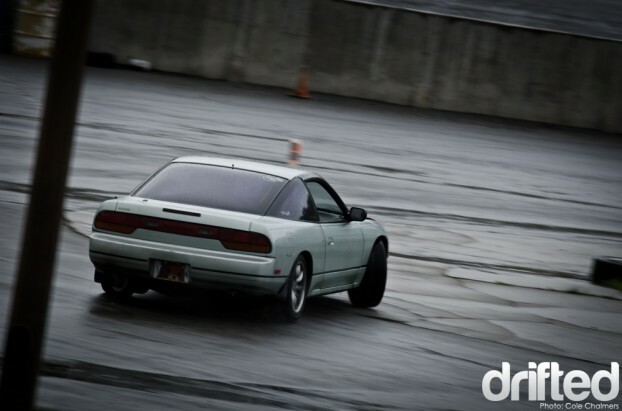 When Drift Union and Drift Squad get together, its become apparent that, things get rowdy. To keep the crowd’s interest as the rain was falling, they were pulled from the stands and lined up along the backside of the infield wall and a big entry/wall tap competition was held on the infield hair pin. Drivers would start from the far bank to gather speed, initiate from as far back as possible into the hairpin, drift though the hairpin and attempt to love tap along the wall in front of the crowd. Jack C held the biggest entry title from early on, but the only person to scrape the wall was Neptune D’s Pete Schroeder. Not only did Pete tap the wall, but he also managed to clip the ‘ski jump’, a small raised cement area used for aiding trailer unloading. Multiple times his car caught airtime mid-drift, reminiscent of those gnarly Ebisu videos. I wish I got a photo, but there is some video footage of it out there. After the competition the sun managed to peek through the clouds a little and dry the track up.